Daily Mirror - FELIX DIAS BANDARANAIKE: THE FAMILY MAN! 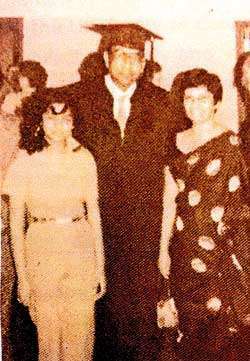 FELIX DIAS BANDARANAIKE: THE FAMILY MAN! June 16 was a dark and dismal day in the calendar of my aunt Lakshmi and her daughter Christine who lost their beloved husband and loving father quite prematurely. Felix Dias Bandaranaike was 53 years of age. This year, it has been 33 years since the passing away of this remarkable husband, father, friend, uncle and politician. There have been numerous articles written about this gentle giant of a great Statesman of an era gone by, truly acknowledging and celebrating his unparalleled integrity, intellectual prowess, courage and beliefs. But for those of us who were blessed to keenly know the towering six foot, aquiline nosed, pipe- smoking, bespectacled, witty family man, it was altogether a different facet of the jewel that we experienced, as we celebrate his family values which were firmly underpinned with kindness and compassion. FDB was born on November 5, 1930 to Reginald and Freda Dias Bandaranaike whose close family the Bandaranaike Dynasty had a tradition in Law and Politics. For FDB it was a natural progression, like a duck taking to water, he glided into a career in Law and Politics effortlessly and immersed himself in the affairs of the State upon completing his ‘home grown’, trail blazing academic career at the University of Colombo and Law College. He was both brilliant and erudite and clearly his intellect, tenacity and ‘courage under fire’, were all too evident in his much debated ‘hits and misses’ in a ruthlessly competitive political arena. FDB continued to dominate the political stage of Sri Lanka for many reasons and seasons. He provided an unparalleled and distinguished service to his motherland as a gallant leader. The accolades were many and criticism no less as Mark Antony lamented in Caesar’s funeral oration: “The Evil that men do lives after them; the good is oft interred with their bones”, and these sentiments reverberated in the actions of men who lost their reason when they crushed and humiliated FDB, an incredibly honest politician. Lakshmi, my aunt and God Mother now an Octogenarian, is mentally agile and very graceful. She met her future husband to be when they were both in their late teens; she had many attributes; She was good-looking, clever and a confident student at Ladies College and, the brilliant, tall, dark and handsome FDB was a student at Royal College; they were both prize winners in their respective schools but the latter more so prolific at it! FDB came from a privileged background but school was a great equalizer. He relished school. He played truant, he smoked, perhaps unwittingly laying a foundation for his lifelong love of the pipe. He would hold his fellow students spell bound with his oratory skills. My aunt would relate how FDB with his sixth formers forced their way into Ladies College premises one particular year, as the ‘big match’ fever descended upon them, sending Miss Opie in to a spin! And poor Miss Opie, like a mother hen scrambling to gather her delirious brood under her wings, had to ‘shoo’ away the intruders. However, it took more than a ‘shoo’ to dislodge FDB and the boys! Gone are the days, the likes of FDB and his cycle brigade who rode battered bicycles to impress the girls and cheer on their schools. Today, the preambleto the fever (not the match) is the ‘flag waving noisy millennial brigades’ parading in luxury cars, blowing their trumpets almost in a frenzy and racing through the streets of Colombo. 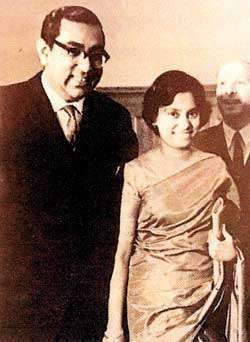 FDB’s and Lakshmi’s romance blossomed and flourished through university and Law College and they married in 1953. They were both partners in a warm and loving marriage and she would always say “I had no friends and Felix was my only friend”. Naturally, FDB was her ‘universe’ and he found her vulnerability irresistible like any other. In return, her warm affection was like a breath of fresh air, a far cry from the ‘stiff upper lip’ Victorian upbringing he had. They fitted like a glove. My aunt would incessantly speak to us about his kindness. “There was never a harsh word from him”, she would remark and in the same breath would add “Felix was a devil to crack jokes and laugh at his own jokes” and trail off laughing, as if walking back in time, remembering the good times they shared together. Elenor Roosevelt said “So I took an interest in politics, but I don’t know whether I enjoyed it. It was a wife’s duty to be interested in whatever interested her husband! Be it politics, books or a particular dish for dinner”. Lakshmi did abide by it all and undertook much more, with exuberance and aplomb for her husband who wore many hats! FDB was a car enthusiast in the day and he drove a vintage Baby Austin which he prized. Somehow this pint sized car fittingly accommodated this oversized man. With Lakshmi beside him he was content even without the loaf of bread & the jug of wine, to roam the countryside on their holidays. They travelled the world together and many are their adventures. The walls of their Mahanuga Gardens home ‘Granta’ is plastered with wonderful memories, some, at the zenith of their political career, with pictures telling their own story and both FDB and Lakshmi standing should.er to shoulder with celebrated Heads of States of yesteryear. In between these years and both becoming Barristers, Christine, their bundle of joy arrived: they named her after FDB’s only sister. Lakshmi recalls how FDB carried the tiny new born in the giant palm of his hand! He was besotted with her from the moment he set eyes on her. 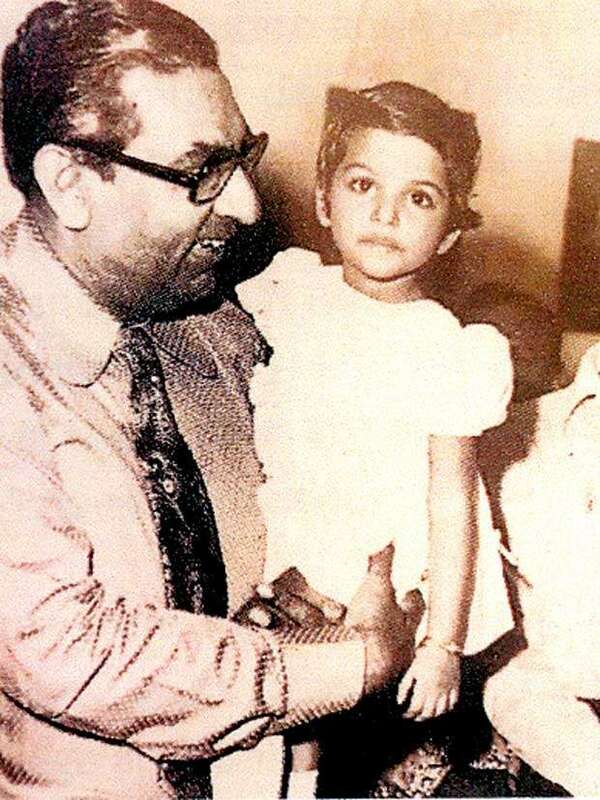 He was a doting and devoted father and she gravitated to him. FDB found time to read bedtime stories to his little princess bringing these fables almost alive by dramatizing in his inimitable style much to her delight but, to the consternation of my aunt as sleep would escape the little girl. Christine would be truly wide awake absolutely enthralled and lost in her dad’s narratives. Lakshmi and Felix had a roller-coaster ride through life and through thick and thin and in good times and bad, they stuck like glue. They were each others’ strength. FDB had a higher calling though, than serving his country selflessly. It was a heaven sent divine proposition at the appointed time, particularly when he was unfairly and harshly dealt by the Machiavellian politicians. He became a victim of ruthless politics and consequently, when his faith in humans dimmed, his faith in the Almighty kicked in like a bolt of lightning! The words of wisdom from the wisest old Sage and King on the futility of man’s labour as “Vanity of vanities! All is vanity”, struck a chord so profoundly in FDB. He now craved to labour only to lay his treasures in heaven. He hungered for the Word of God and to understand the deep mysteries it revealed. He enrolled at a Bible College in Portland, Oregon for a degree in Theology. The few years he spent in the USA with Lakshmi and Christine devoid from politics were truly happy and peaceful in nature. Above all, FDB was in harmony with God and man; he had made his peace. Just before he could commence his post-graduate studies in Theology, he was struck down unfairly by a dreaded illness and entered glory on June 26, 1985 to become a citizen of heaven.